Eyes On The Sky > Blog - A win for dark skies! A win for dark skies! First, it's a bad idea to tell me, "That won't happen"
There is nothing like someone telling me, "You'll never get that done." About 10 years ago I was told something similar with respect to getting some stop signs put on my street. You see, I live on what amounts to a dead-end street. Well, not exactly, but there is a business at the end of it, so it is not a through street. At the time, the business that was there had two shifts. The second shift started at 6:00, and their lunch was around 10:00 at night. Every night just before 6:00, then a few minutes after 10 and a few minutes before 10:30 (on their way too, and back from, their lunch break), a dozen or so cars and trucks would accelerate ALL the way up (or down) our street as the left for lunch break, then returned. Our speed limit was, at the time, 30 mph (currently 25). I would easily guess that, while accelerating, these vehicles were going 40 to 45 mph as they passed our house. Mind you, our street is only 4 (short!) blocks long! They were certainly going 50 mph before they'd slam on the brakes at the stop sign at the corner. I had two small children then. I was told by various, long-time neighbors, "We've been trying for years to get stop signs put in." "How hard have you been trying?" I inquired. I had a hard time believing that 'everyone' had been asked. But I wanted to get something done about it, to keep my kids safe (along with people crossing the street!). So I put together a petition asking for stop signs at three intersections, loaded my kids up into a wagon, and walked around the neighborhood and asking residents if it was a smart thing to have stop signs to slow people down so they wouldn't drive so fast on the street. They'd look at me, see my kids, and immediately sign. You see, I had been in sales for about 7 years then. I knew that an emotionally appealing argument was a winner. My emotionally appealing argument was, "Shouldn't our kids be safe?" without actually having to say that. I presented the petition to our local government. I was asked, with a bit of exasperation evident at the prospect of putting up 6 stop signs at three intersections all within a block of each other, "What do you REALLY want?" Ah, yes.. the negotiation phase. I'd thought of this ahead of time - it's why I asked for THREE stop signs, when all I really wanted was one. So I told them the intersection that needed it most. They thanked me for my interest, said they'd look into it. In under 6 months, guess what happened? Two stop signs put up at the intersection. Not just any lights, but "spray everywhere" acorn bulb-style streetlights. Not only do they affect my viewing, they shine into my daughters bedroom windows. They can't open their light-block curtains on nice summer nights for fresh air - it's too bright. But there's another light that's just as bad - a neighbor's light. It's a typical post-lamp, yard-type fixture. They have put standard 60W incandescent (and recently, 13W, similar brightness CFL's) into it for a while. I asked if they would please consider using the silver-crown style bulbs I've highlighted in "Eyes on the Sky" Dark Sky Facts and on the homepage of this site. They tried it... for less than 48 hours. Now, I had approached this in what I felt was the right way. I did it politely, by talking about how it affects my daughter's room, and how it affects my astronomy observing, but mostly the fact that my daughter can't open her curtains (this neighbor still kept saying, "Buy curtains" to which I kept saying, "We have.") So when I inquired as to why they changed the bulb back to the "bad" one, I was told, "We like it - the other one is too dim." Now what this meant was, "I can't see the light shining into my eyes, so it looks dimmer to me." The fact was, it actually put MORE light down on the ground on both their driveway and sidewalk, and with NO glare at all. I know. I saw the difference. But they didn't like that. I was told, "Look at the streetlight - it shines in her room too, doesn't it?" True enough, I conceded. But I said I could get that changed. Then I was told the magic words. "You'll never get that changed. The electric company won't change that for you." So back in July, I contacted our local municipality's liason. I emailed him pictures, and explained the situation, and quoted the relevant lighting ordinance text that dealt with lighting as a "nuisance" for off-street parking. After some back and forth and some confusion over who "owned" the street lights in questions (our municipality or the electric company), I finally got in touch with the electric company person who handles those street lights, three months later. I explained the situation to him via email. I asked for TWO streetlights to be changed (again, negotiation! ); both that one, and the other one up the street so that when the leaves fell off the trees, it wouldn't shine into my OTHER daughter's bedroom. The next day, a foreman came out to determine if the lights were theirs. He left a door hangar indicating they were. THREE DAYS LATER (on a Sunday no less! ), two crews came out and switched out the two light fixtures (I got ALL of what I asked for!). Here's how one of them looked (see photo below) - and yes, there was FAR less light in my daughter's room via light trespass, and the SAME amount of light on the intersection. So yeah... tell me I can't get something done? That's GREAT motivation for me, because I had been procrastinating about how to approach this issue previously. All I needed was incentive to get it started. But, don't be like me and wait to get started! Learn from my experience (click this link for language I used in emails to get this done), and above all, be PATIENT, be PERSISTENT, and most of all, be POLITE, even when things aren't going your way. If you get nowhere, keep at it - you may have to go over someone's head, or gather neighbor's who have light shining in their bedrooms to get government officials attention. But it CAN bear fruit. This is one success story. I hope you have have success too! The neighbor's light still hasn't changed, but that same local government official will be meeting with me in mid-November to see it for himself, and discuss it with me. I'll update that when I know more. Re: A win for dark skies! Yeah!Yeah! Kudos! Wow! ...I'm so Happy!!! Dave, Congratulations! Would you like us to send in thank you letters? Can we get a news story? Certainly, we can highlight it on websites and fb. This is very cool. Can't wait to hear the followup stories from others who took your lead. Nothing beats grassroots determination... especially synergized. Fabulous post and love the pix. 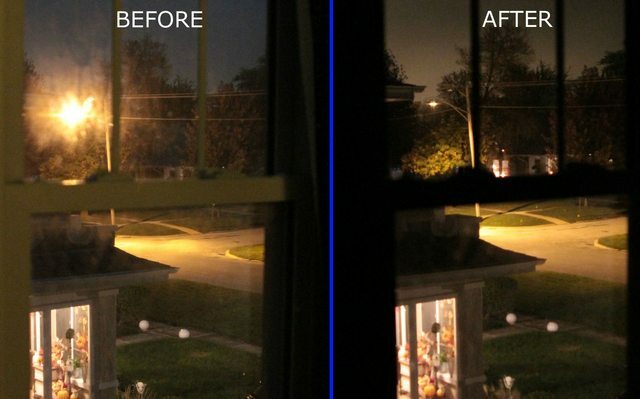 Would it be ok to post the before & after street light pix on my personal FB page, with a link to your blog? I am a big supporter of Dark Skies.